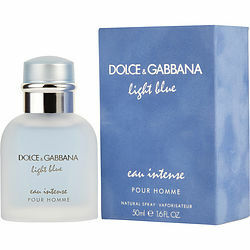 I recently purchased dolce gabbana light blue intense an it is great. Smells great the projection last for about 2 hrs then it gets really close the skin but also stays very airy. This is a great summer time fragrance. This is my favorite scent I am so happy that I found this fragrance. Just did add a review of Dolce and Gabbana Light Blue, It smells great, but isn't a long-lasting fragrance. Dolce and Gabbana Light Blue eau intenservice smells great,I love the smell, but it's not a long-lasting fragrance. And for the money you should be getting something that lasts all day not just an hour or two.!! I gave my significant other D& G Light blue eau as a birthday gift. He's not allowed to open before his day. However, I'm certain he will love it.